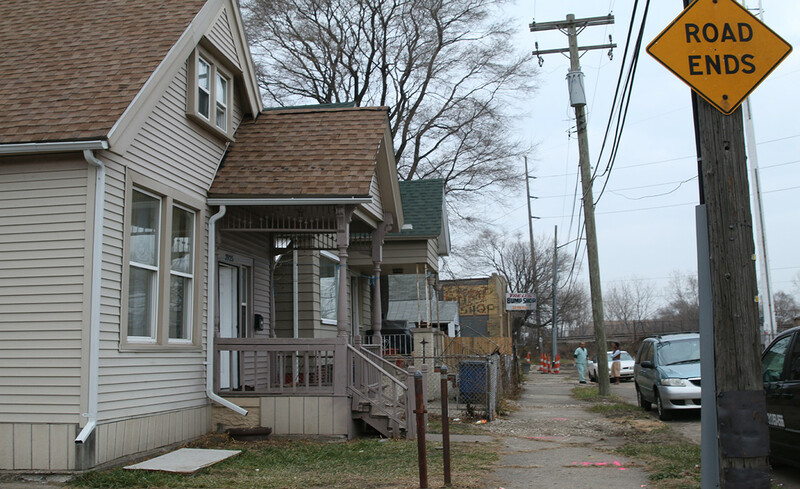 The home of a recently resettled Syrian refugee family in Hamtramck, Michigan. Photo by Kanyakrit Vongkiatkajorn. The five CUNY Graduate School of Journalism students who teamed up last fall to report on the challenges facing Syrian refugees in the U.S. did everything by the book – and then some. Our instinct drove us to approach the interactive like a news story, even if the presentation would be a far cry from traditional journalism. Under the guidance of their Investigative Journalism professor, New York Times reporter Andrew W. Lehren, the students scoured hundreds of documents and found that some nonprofits charged with helping resettle refugees have records of misspending money. The students interviewed refugee advocates and discovered that crucial services aren’t being delivered as promised. They travelled from New York to Hamtramck, MI, and El Cajon, CA, to capture the stories of newly arrived Syrians in words, pictures and audio. “Unsettling” incorporated many pieces of interactive journalism to create a holistic experience for its readers. Screenshot from “Unsettling”. 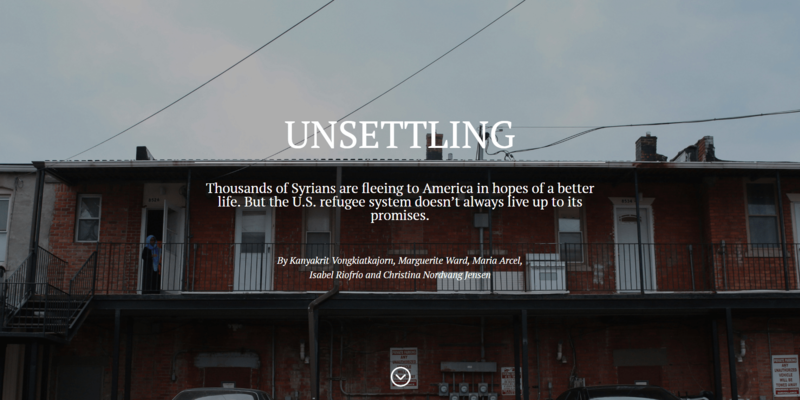 But Lehren and Co. wanted to take their multimedia special report – called “Unsettling” – to a higher level by using evolving storytelling technology to help the audience experience, at least virtually, the plight of Syrians grasping for piece of the American Dream. The students, with the help of Lehren and the authors of this article, produced “Living Like a Refugee,” a personalized interactive that puts users in the well-worn shoes of recent arrivals facing tough decisions amid shortages of money and time. We set out to create what we call a “digital empathy machine” – offering audiences insight they might not glean from words and images alone. In the process, we gained insight ourselves as we examined the different types of personalized interactives starting to pop up and came away with tips on building these new storytelling experiences. We started our Syria interactive process working off a simple, stark fact: Refugees get a one-time subsidy of $1,125 per person. Then we asked a simple, stark question: Do you think you could make ends meet for the first three months on that amount? The user is guided through a series of questions requiring difficult spending choices. With each answer, the user is directed down another path as a built-in calculator shows available funds dwindling with each purchase. But we looked at far more than hard numbers. Our team’s interviews with refugees informed some spending options. We heard stories of parents struggling to buy their children school supplies. Some refugees spoke of difficult choices over whether to purchase a used car to get to decent-paying jobs or to take lower-wage work a bus ride away. Then, of course, there were unexpected expenses – like medical emergencies, not uncommon for people grappling with physical and psychological scars of civil war. Splash page for personalized “Living Like a Refugee” interactive. Screenshot from “Unsettling”. While we used elements of gamification in “Living Like a Refugee,” we were cognizant throughout of the gravity of our subject and asked ourselves each step of the way whether our interactive offered a fair and accurate representation of the refugee experience. Be Ambitious but Keep it Simple – Strive for clarity and concision in words and visual cues. Ease of use is crucial. Users must be able to answer off the top of their heads. The whole experience shouldn’t take more than three minutes. Tell a Story – These interactives represent a new form of storytelling, even if some “stories” will be quite short. Keep Your Eye on the I’s: Information and Insight – A major goal is to help people learn about their own situation and/or that of others. Report it Out – A strong personalized interactive involves gathering information from various sources – everything from data to interviews. Map it Out – Don’t plunge in. Sketch out your plan first. Storyboarding on paper will help in most cases. Try it Out – Test it yourself and test it on others – and not just colleagues. Get it Out – Make it portable and use it as a social media lure to a bigger story or story package. Think about different potential audiences/constituencies and how you can target them. Decision-makers: These can help guide people to making smart, informed choices by providing targeted information. A good example is the New York Daily News’ “How Safe is Your Child’s Day Care?” Simply type in an address or zip code and get a map of area day care centers – with safety records a click away. Perspective-givers: These can help show people where they fit into the news. One of our favorites examples is The Wall Street Journal’s “What’s Your Pay Gap?” Context also can come in lighter forms: Check out this Times interactive that brings the Olympics to your doorstep. But we don’t want personalized interactives to be the sole province of big players and journalism schools. The authors are now working, with support from the Challenge Fund for Innovation in Journalism Education through the Online News Association, to create PathChartr – a plug-and-play tool that would allow newsrooms of all kinds to produce personalized interactives without needing a coder. We’re hoping to open more eyes to the possibilities presented by this form of journalism – just like effective personalized interactives can help you see something in a new, different way. Jere Hester (@Jere_Hester) is the CUNY Graduate School of Journalism’s Director of News Products and Projects, and Director of Reporting and Writing. Sandeep Junnarkar (@sandeep_NYC) is the J-School’s Director of Interactive Journalism.